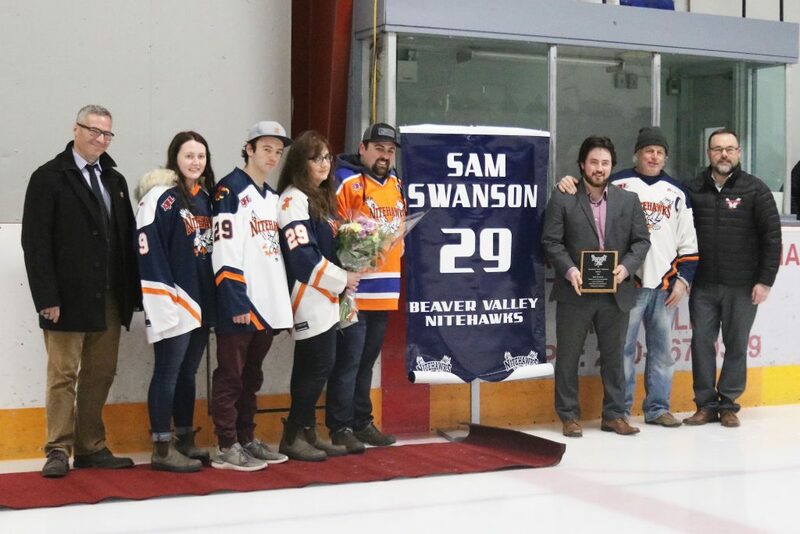 The Beaver Valley Nitehawks honoured Fruitvale native Sam Swanson on Wednesday night at the Beaver Valley Arena. With over 300 fans, teammates, and family on hand, the Nitehawks retired the former captain’s No. 29 jersey in a ceremony prior to the Nitehawks-Castlegar Rebels game. Sam was joined on the ice by his father Jim, mother Karyn, brothers Jake and Ryan and sister Lindsay with coach Terry Jones and team president Steve Piccolo offering words of praise and thanks to the five-year veteran and consummate team leader who wore the Nitehawks jersey from 2013 to 2018 and captained the team his final two years. Swanson becomes just the fourth Nitehawk player to have his jersey retired. His number 29 will be lifted to the rafters and suspended beside Fruitvale products Adam Deadmarsh (Colorado Avalanche, L.A. Kings) and Barret Jackman (St. Louis Blues) who went on to illustrious NHL careers, and goaltender Rocky Dickson who played five seasons for the Hawks and backstopped B.V. to their first two KIJHL titles in ‘97 and ‘99 and the Cyclone Taylor Cup in 1997. 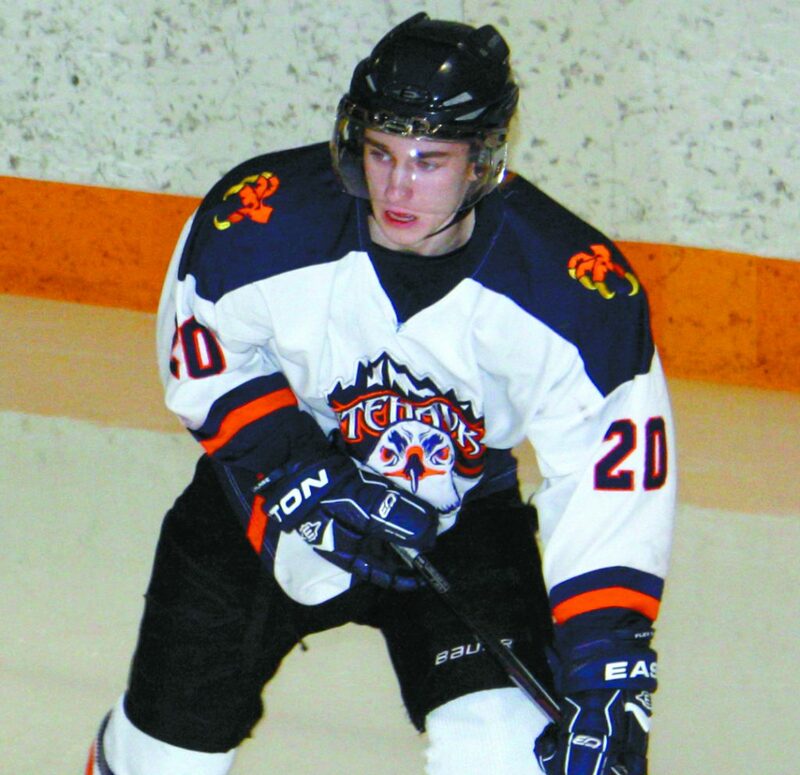 Swanson played five full seasons for the Nitehawks, appearing in 206 regular season and 68 playoff games. He led the team to four Neil Murdoch Division banners, two KIJHL championships, two Cyclone Taylor titles, and a Western Canadian Keystone Cup. 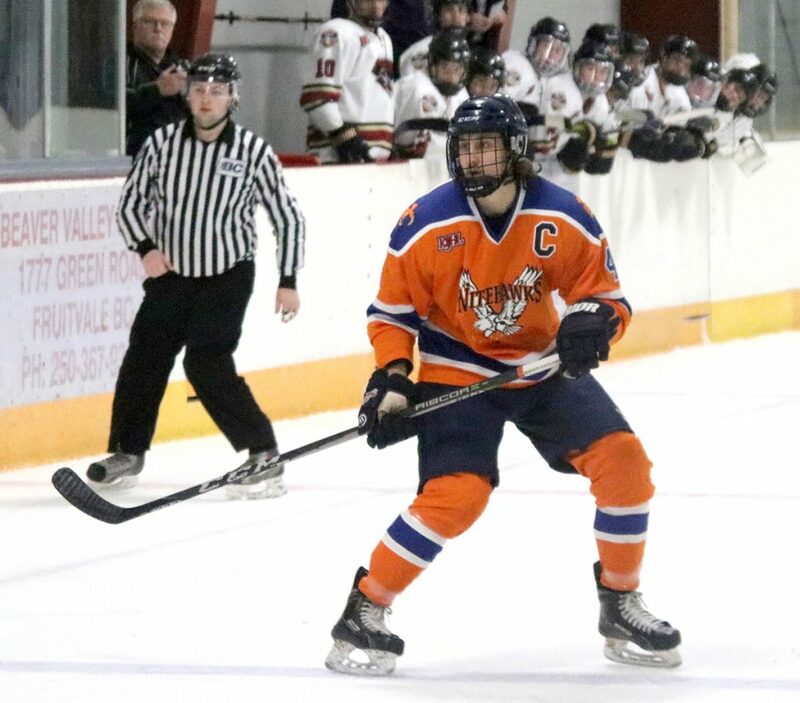 The five-foot-eight, 180-pound forward scored 56 goals and 140 points in the regular season and another 10 goals and 36 points in the playoffs, combining skill with physicality and also racking up 158 penalty minutes. 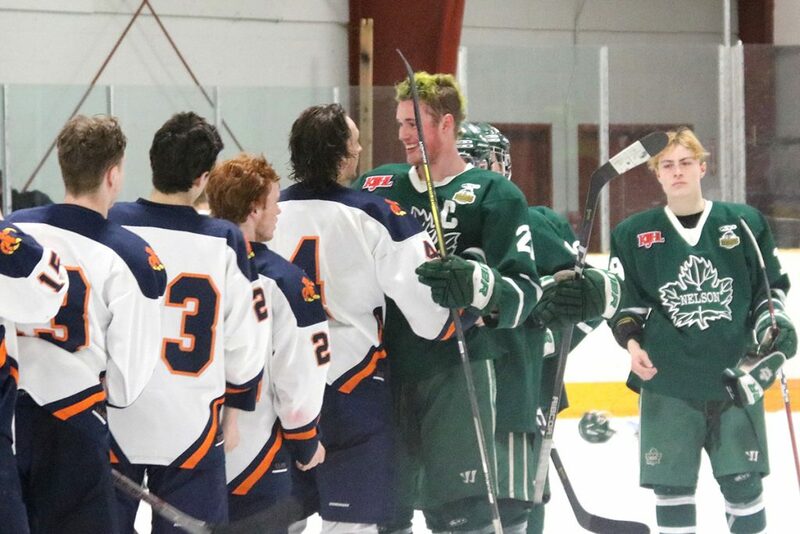 “Any time you have a player play five years for you and this individual contributes the way that Sam did, first as a 16 year old and just learning how to play junior hockey and really just learning what our organization was about, then turning into a perfect example of what we want, and not just players to be, but for parents to see that this is the kind of individual we want here,” said Nitehawks General Manager Jamie Cominotto. Swanson was not the team’s most prolific scorer, but his dedication, leadership qualities, resilience, and skill-set showed early and in addition to an already solid pedigree, former Beaver Valley captains Archie McKinnon and Taylor Stafford also helped shape the player Swanson was to become. Of the many championships and individual awards attained over his career, one stands out among them. 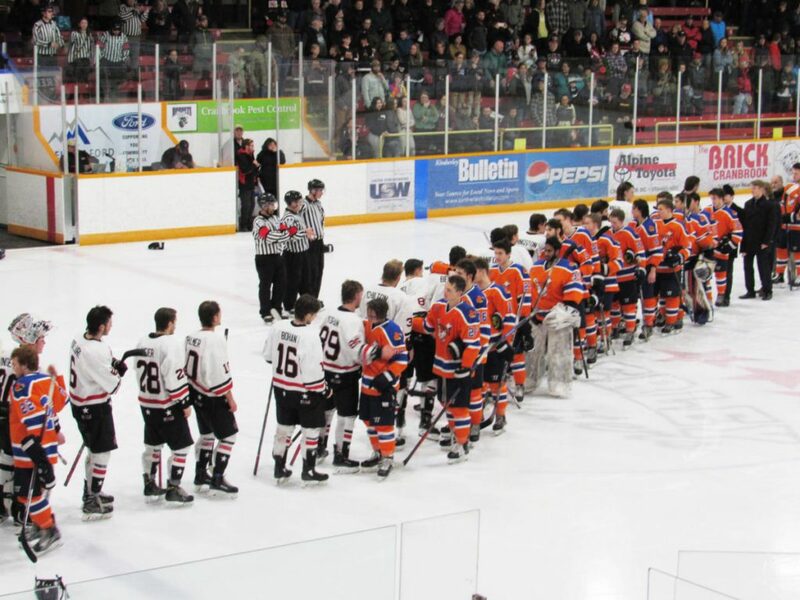 After winning the 2014 Cyclone and Keystone Cups, the Nitehawks had lost the following two Kootenay Conference championships to the Kimberley Dynamiters and in his fourth year as a 19-year-old, the Hawks met the Dynamiters again in the 2017 conference final. Few players have made such an enduring impact on a team or its players, but even though he misses the action on the ice, a new career may be on the horizon.